Thinking Matters is a ministry encouraging New Zealand Christians to explore WHAT they believe and WHY they believe it, so they can engage culture and present the Christian faith gracefully and persuasively. We do this through training in apologetics, worldview, culture, and evangelism. DEFEND FAITH: Prepare Christians with the knowledge and understanding needed to make a compelling case for their faith. NAVIGATE CULTURE: Help believers recognise and respond to the challenges of culture with confidence, love, wisdom, and grace. REACH PEOPLE: Inspire and empower followers of Christ to persuasively and lovingly share God’s message of hope. Thinking Matters seeks an intellectually vibrant and lovingly engaged Church transformed by a renewing of the mind, confidently navigating and impacting culture with the truth of Christianity. Church: We partner with Churches to run seminars, events, and conferences aimed at strengthening, inspiring, and mobilising the body of Christ to live out a confident, vibrant, and missional faith. Youth & Next-Gen: We equip youth, young adults, and those who work with them with training events and resources. Leaders: We facilitate training workshops and professional development for pastors, ministry leaders, speakers and influencers. Educators: We offer speakers, programs, and material for Christian schools, colleges and tertiary providers. Humility: We equip Christians in leadership and the wider body and persuade non-believers with modesty and respect. Compassion: Live out The Great Commission in everyday life, seeking to love one another by sharing the truth in any setting and at any cost. Integrity: Being a follower of Christ who demonstrates character and a love for others – being willing to speak the truth clearly and with love. Enthusiasm: Having a passion to see Christians encouraged and equipped with training in apologetics and worldview. Connectedness: Being able to build trust and respect through healthy connections with others. Devotion: Acknowledges a dependence on the power of the Holy Spirit in all their efforts. 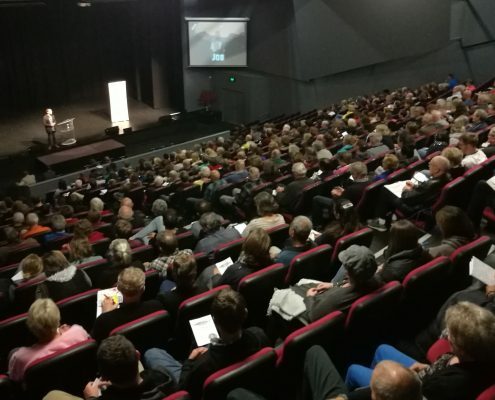 Founded in 2008 and launched in Tauranga by William Lane Craig while on tour in New Zealand, we started as a loose network of like-minded people who wanted to help the Church meet the increasing need for apologetics and worldview thinking in our post-Christian culture. Under the leadership of Rodney Lake we have partnered with churches, ministries and individuals to form a network of professional and lay apologists throughout New Zealand and now have over 60 volunteers working online, running events, speaking, teaching as well as staff specialising in the areas of Youth and Next-gen, Speaker Development and Leadership Development. Our head office is in Tauranga and we have regional branches all over New Zealand running regular events in Auckland, Tauranga, Hamilton, Palmerston North, Wellington, Christchurch, and soon Dunedin. We also have campus-based apologists at Auckland University, Waikato University, Victoria University and Canterbury University. Follow our activities by subscribing to our email list and following us on Instagram and Facebook. If you have something to offer and want to join our growing team please contact us here. We are a registered charitable trust so you can financially support our work here. Our Statement of Faith can be found here and our board of directors are here.